Click on each section on the page to complete that part, once you're done, hit save and you'll have created or updated a Task for your Sites. Choose a short, clear concise title, avoiding jargon where possible. 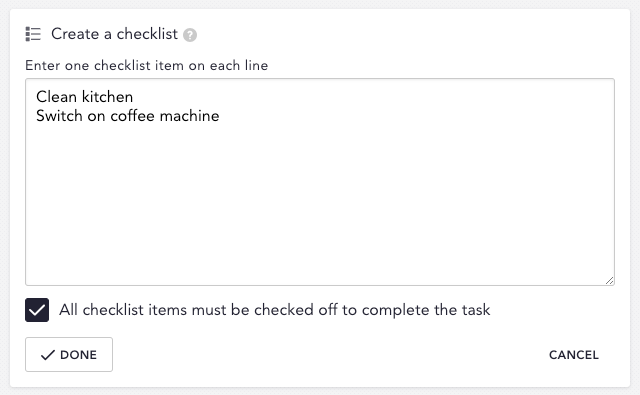 Enter each checklist item on its own line. 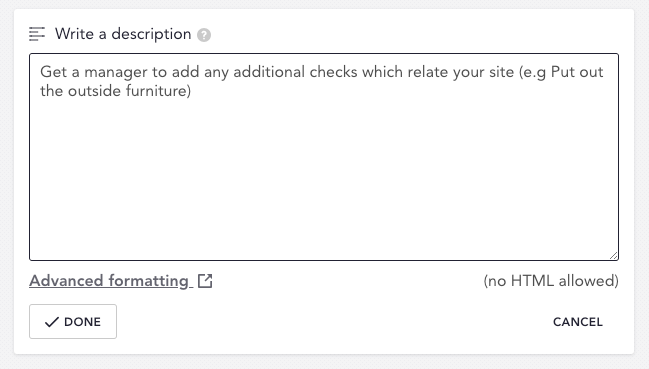 Uncheck the box beneath the text box to allow the task to be “Marked as done” without all the subtasks being checked off. Add important context for your as well as instructions on how to complete the task. 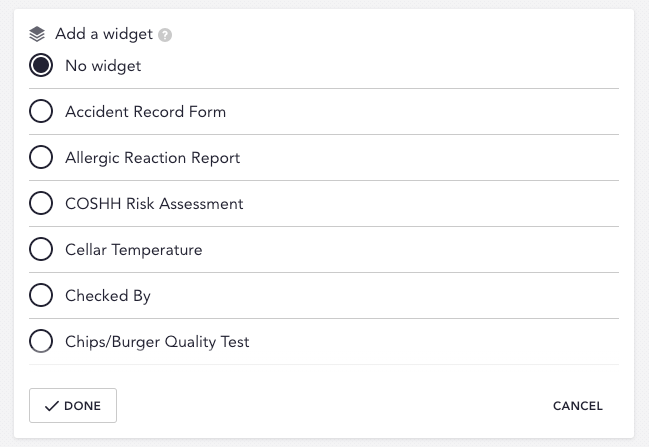 For example, add temperature ranges, or the steps your team will need to take if a task cannot be completed to your organisation’s standards. 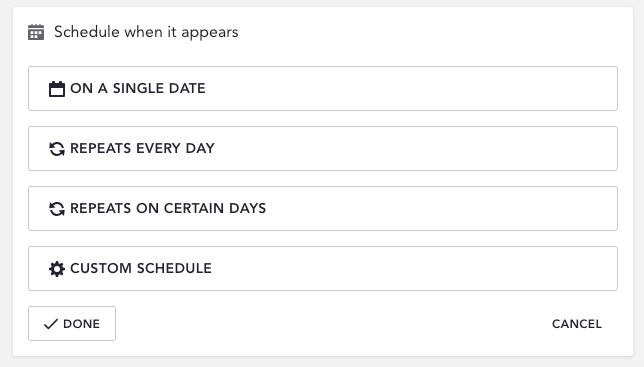 The second toggle switches your task from a Scheduled task to an On Demand one (and back). An On Demand task is any that you want added to Trail only when needed. For example, an Accident report. The last step to creating your task is scheduling it. When do you want it to start? When should it be done by? All these can be set with the scheduling section, for more information how it works check out this article. 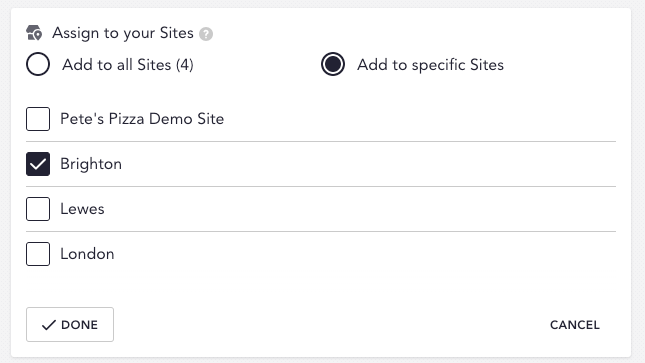 By default tasks are assigned to all sites, but you can also choose specific sites for more control. Remember that tasks can also be bulk-assigned to several sites at once from the Task Planner. 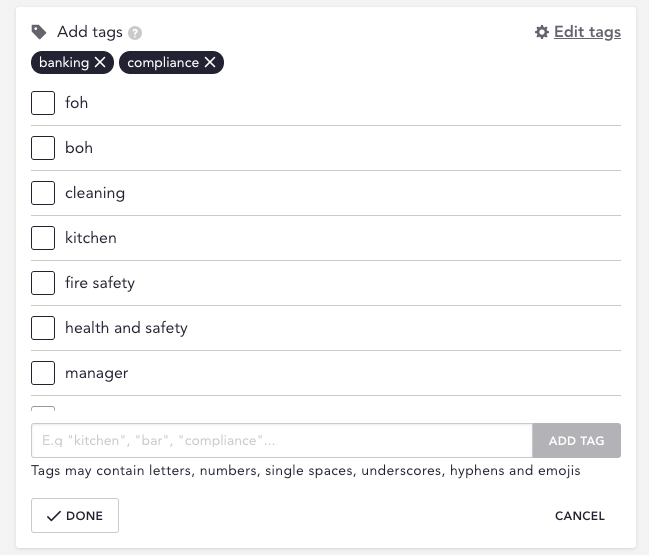 Use tags to organise tasks by role or department - for example by Kitchen or Front of House. Teams can then filter down to just their tasks. Find our more about tags and learn about filtering Trails. Here you can upload a file (by clicking on the button that says “Upload File”) or you can add a link to a website, by copying and pasting (or typing) the link into the box and clicking “Add link”. By clicking where it says “Attach another file or link”, you will bring up another section where you can add another file or link. Tip: If you accidentally click “Attach another file or link” or change your mind and want to remove the second box, all you need to do is click the button that says “cancel”. On your Trails, you’ll be able to add data capture or form widgets. This next section is where you’ll add them, by selecting them from the list. Tip: If you’d like to add a widget that you don’t see on your list, reach out to us via the in-app chat tool found on the bottom right hand corner of Trail, or email us at support@trailapp.com. 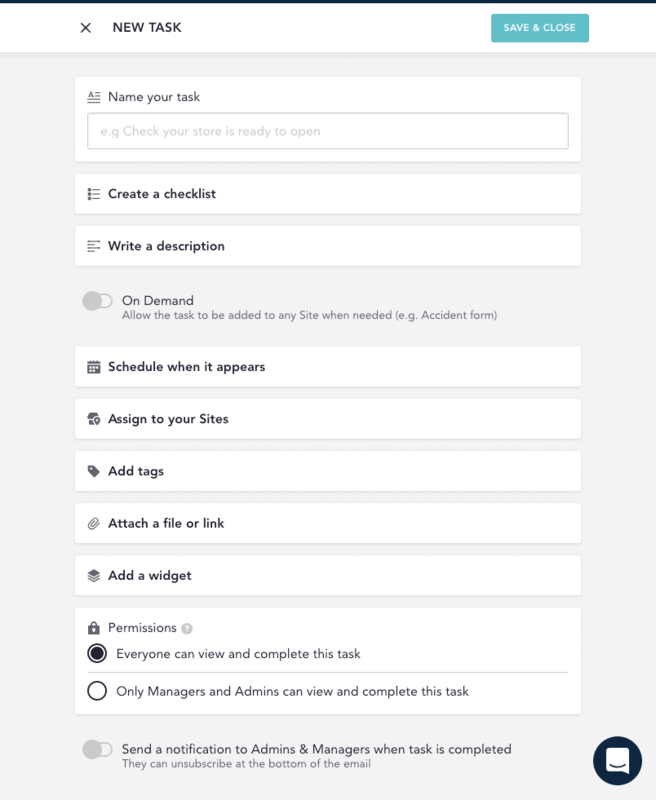 Sometimes you need to create tasks which only your Admin and Manager users can view and complete, you can set this here. By default everyone can see and complete a task. Turning this toggle on lets you receive notifications when the task has been completed. Perfect for keeping tabs on critical tasks. And that’s everything you need to know to get you started with creating your tasks!